Shrapit Yoga or Shrapit Dosha or Cursed Conjunction. I won't blame you guys if you haven't heard about this yoga. It is a very new type of dreadful and feared yoga in our astrological world. I came to know about this one because I have it in my horoscope. Some enlightened people and some websites gave me this information that my horoscope is cursed, which in turn means I am cursed. So, let's see what this Shrapit Yoga is all about. So, as per these enlightened sources, Shrapit Yoga happens when Rahu and Saturn (two of the strongest malefics) are placed in the 10th house of a horoscope. Reason? 10th house is house of person's work environment, father, reputation in society and fame. As they say, Rahu and Saturn in 10th house won't let anyone's career grow, cause defame in society and blah blah blah. 1. 10th house is original house of Capricorn sign because Capricorn is 10th zodiac sign. Capricorn is ruled by Saturn. So, Saturn is in its own house. So, it should give good results. 2. In some books of Astrology, Rahu is said to be the agent of Saturn. In other way of saying, Rahu is actually the shadow of Saturn, just like Ketu is a shadow of Mars. So, agent and principal sitting in same house. I don't think there should be any problem. 3. 10th house is one of the Upachaya Houses (Houses # 3, 6, 10 & 11). Upachaya means they grow with time and start giving results in 30s of a person and Saturn placed in any house, delays the proceedings of that house. So, it can be understood that these people will get success in career in their 30s, but it is not that their career will be doomed. Moreover, all malefic planets do exceptionally well in all the Upachaya Houses. 4. Rahu in the 10th house makes the person obsessive about fame and Saturn's presence there insures that these people will get fame for a life time. Saturn only delays, it never denies. So, if person is willing to put hard work and be patient for fame then Saturn gives them life long fame. 5. Rahu and Saturn combine in a house for 1 and half years, as Rahu changes its sign in 18 months' time. Like recently, Rahu and Saturn remained in Libra for about 18 months time between January 2013 to July 2014. Now, Libra becomes 10th house for all the Capricorn Ascendant people. To say that all Capricorn Ascendant people born in last 18 months were cursed is nothing less that madness. 6. Read the horoscope overall. Nothing is cursed. We all got birth on divine will. God can't make us cursed. Everyone of us is blessed being. @ AM - it is better for you to start your own work as Rahu-Saturn in 10th may not allow you to work peacefully in job setup. I have Saturn and Rahu in my 10th whole house in Anuradha. With transiting Jupiter in Scorpio now - will that help me in searching for a job? I had quit work at the request of my widowed daughter to babysit my granddaughter. Now she is in school all day and I can look for work again. I read about this Yogi for the first time today and it scared me to death so I was happy to see your article. 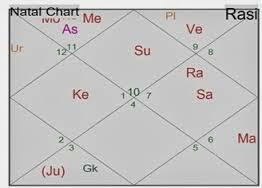 @ Gouri - I need to look at full chart to guide u, pls apply for specific consultation. @ ranjan - though i m unaware of ancient shastra, I thank you for comment and appreciation. @ nikunj - mainly it relates to 10th house. I just installed this app and found it so good and surely it is a devine time for me that i got this app today. Thsnk you for your contribution. It is true for me that 10th house activates in 30th year a i got job in 30th and Saturn plaec in 10th house in Libra in my chart.